Part Four of Six*. Part Three can be found here. Source: History of San Diego by William E. Smythe. All quotes are from this book. By John Lawrence / From the original San Diego Free Press, circa 1969. During the years 1770- 1775 the San Diego Mission, newly transplanted from Old Town to its present location in Mission Valley, managed to survive. The priests even managed to convert a few Indians. Of course the techniques of conversion were not always the most “Christian.” Whereas Christ fed the multitudes and advocated no-strings-attached giving to the needy, the Spanish priests modified that scheme as the following quote from Smythe shows: “Those who had accepted the new faith had been clothed and fed, while those who rejected the faith had been let alone.” Nice guys, the priests: bribery was for them an acceptable method of religious inducement. After 5 Years of this treatment, the Indians had had enough. They decided to revolt against the Spanish settlement which had imposed itself on their homeland. The first Indian uprising was on November 4, 1775, a date that should be celebrated by the people of San Diego as it marked the initiation of the people’s struggle for liberation which is still being waged today, 200 years later. One can only speculate as to whether the Spanish soldiers had had too much tequila and were sleeping it off as the battle raged at the Mission. It should be noted that, to their credit, the “converted” Indians, who were housed in their second class quarters adjacent to the mission, lifted not a finger to fight against their brothers. Every battle has its absurd aspects and the one at the San Diego Mission was no exception. Father Luis Jaume, who must have been high on peyote, walked out to the Indians and tried to work his priestly magic in an attempt to dissuade them from their warlike behavior. We quote Smythe: “He walked straight to the nearest and wildest group of savages and, extending his arms and smiling a gracious greeting, said ‘Children, love God! '” Needless to say, Father Jaume’s mystical religious powers failed him, and he didn’t survive the night. 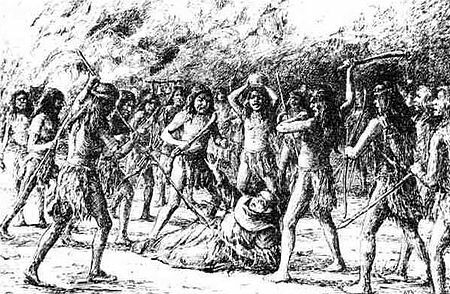 The Indians finally dispersed, leaving the Mission in ruins. However, there were survivors, and they set about the task of rebuilding again. John Thank you for sharing this bit of history. I appreciate the opportunity to learn.